Let's consider our example again, with the control connection from port 1678 on the client to port 21 on the server, but this time consider data transfer using a passive connection, as illustrated in Figure 291. The client would issue the PASV command to tell the server it wanted to use passive data control. The Server-PI would reply back with a port number for the client to use, say port 2223. The Server-PI would then instruct the Server-DTP to listen on this port 2223. The User-PI would instruct the User-DTP to create a connection from client port 1742 to server port 2223. The server would acknowledge this and then data could be sent and received, again in either direction. 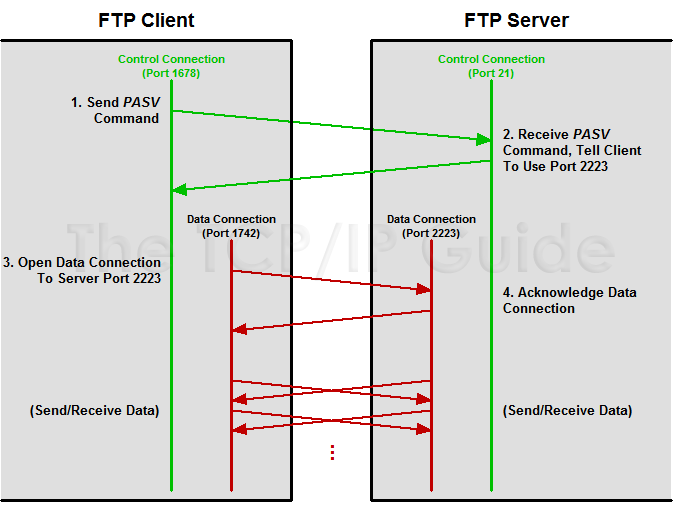 In a passive FTP data connection, the client uses the PASV command to tell the server to wait for the client to establish the data connection. The server responds, telling the client what port it should use on the server for the data transmission, in this case port 2223. The client then opens the data connection using that port number on the server and a client port number of its own choosing, in this case 1742. Contrast to Figure 291.